The Quran defines the concept of the Zakat (Obligatory Charity) and outlines all the guidelines related to its payment. This page presents all related aspects of this religious duty. 1- When was the Zakat first decreed and to whom? (Quran 21.73) We made them leaders who guide by Our command and We inspired them to work good deeds, to observe the Salat and to give the Zakat, they were worshippers of Us. 2- What is the Quranic definition of the Zakat? The Zakat is an obligatory payment on all believers who have an income. This payment is to be paid to in accordance to God’s instructions (see section 6). (Quran 2.219) They ask you what to spend, say: ‘al-affwoo’. God thus clarifies the revelations for you that you may reflect. (Quran 4.153) Then they set up the calf after the miracles came to them, ‘fa afawna aan zalika’ (We pardoned them for that). (Quran 3.134) (those) who spend in prosperity and hardship, and the suppressors of rage, and ‘al-aafeen aan al-naas’ (the ones who pardon the people). God loves the good-doers. (Quran 5.101) O you who believe, do not ask about matters which, if revealed to you, would hurt you, but if you ask about them when the Quran is being brought down, they will become clear to you. God has ‘aafa aanha’ (pardoned those matters). God is Forgiver, Forbearing. According to the above verse, we can see that the word “al-affwoo” (and its derivatives) has been used to mean: that which has been pardoned or overlooked. If we apply this to the word “al-affwoo” which is used in 2.219 and which is related to the payment of Zakat, we can see that God is telling us that we should pay Zakat (charity) from that part of our income which we can afford to give away without the need to ask for it back, or in other words what we can afford to overlook and pardon without incurring any hardship. It is significant that God did not define or quantize the exact portion of our incomes which we are able to give to charity and be able to overlook it (not ask for it back). God knows that this will be different for each individual and directly dependant on each’s income and circumstances. It is also dependant on each person’s desire to do righteousness. Consequently, God left it to each indivual to assess his/her own needs and obligations, and then decide what portion of one’s excess income that can be given away and overlooked without incurring any hardship. 3- When should the Zakat be paid? (Quran 6.141) Eat from their fruits when it blossoms, and give its decreed obligation on the day of its harvest. This Quranic verse makes it necessary that we should pay the Zakat whenever we receive income. The Muslims who follow corrupt un-Quranic laws have lost this most important commandment; they calculate and give Zakat only once a year on the total annual income, which may have been generated through wages, interest, dividends …. etc). In this Quranic command to pay Zakat whenever there is an income (harvest) lies a very beneficial economic wisdom. One of the factors that contribute to the economic prosperity of any community is the circulation of money. Higher circulation of money is much more productive than slower circulation. If Zakat is paid whenever income is generated the economy will benefit much more than if Zakat is paid only once a year on the year’s total earnings. 4- Who should pay the Zakat? Is the Zakat compulsory on all believers, even if they are poor and cannot afford to give away any of their income? This means that for those who receive an income that is only enough to feed and clothe their families, but with nothing to spare, are not required to pay zakat. (Quran 22.78) You shall strive for the cause of God in the sincerity the cause deserves. He has chosen you and has placed no hardship on you within the religion. 5- Who should the Zakat be paid to? (Quran 17.26) You shall give the relatives ‘haqahu’ (his due), as well as the needy and the homeless yet do not squander wastefully. The use of the word ‘haqahu’ indicates that God is speaking of the obligatory Zakat and not about voluntary charities. In 2.215, we get a more detailed list of the recipients who are already outlined in 17.26. So the main group of “the relatives” in 17.26 is divided into the “parents and the close ones” in 2:215. Also, the “needy” in 17.26 is split into the “orphans and the needy” in 2.215. These are not extra recipients since the partents are included under “relatives” and also the orphans are among the “needy“. Some scholars have indicated that the Zakat should only be paid to Muslim recipients, however this restriction has no Quranic reference. The recipients of the Zakat (outlined in 17.26) could be of any faith or creed. 6- Does the Quran authorise a fixed rate of Zakat? The straightforward answer is NO. Nowehere in the Quran is there any hint of a fixed rate. The 2.5% which is followed by Muslims around the world rate is not found in the Quran. The source of this ritual, as many other non Quranic rituals, can only be found in the ‘hadith’ collections. We have seen that the Quran defines the Zakat payment from ‘Al-AFW’, which is what a person is able to give away without incurring any great hardship. Obviously this amount will differ from person to another depending on each’s income. (Quran 17.26-29) You shall give the relatives ‘haqahu’ (their due), as well as the needy and the homeless yet do not squander wastefully. The squanderers are brothers to the devils and the devil is a rejecter of his Lord. If you have to turn away from them, seeking the mercy from your Lord which you desire, still speak to them nicely. Do not keep your hand tied to your neck, nor shall you fully extend it, lest you end up blaming yourself and regretful. We must meditate on these words for a while and then pose the following question: If God had actually set a fixed percentage (as the 2.5%) for the payment of the Zakat (due alms), would God command us “Do not keep your hand tied to your neck” nor “fully extend it”? These words can only mean that the percentage is NOT fixed, but is flexible and that it has been left to each individual’s means. Zakat charity is given great importantance in the Quran, the Most Merciful has associated His Mercy to those who pay their zakat. (Quran 41.6-7)Woe to the mushrikeen who do not give the Zakat and with regards to the Hereafter, they are disbelievers. 8- How many Zakat’s are there? Once again, some scholars who advocate a version of Islam which is based on hadith rather than Quran, have invented all kinds of Zakat like Zakat Eid Al-Fitr (the Zakat at the Eid at the end of Ramadan). They have instituted different Zakat’s to be paid at all different feasts and celebrations. Needless to say, all these additional Zakat have no authorisation in the Quran. The only timing given in the Quran when the Zakat is due is when income is earned. The Quranic Zakat authorised by God is not connected to any specific days in the calendar nor to any feasts or special occasions. 9- What is the difference between Zakat and Sadaqaat? As we have seen, the use of the word “Haqq” in 6.141 and 17.26 confirms that the act of Zakat is obligatory, but when we come to the Sadaqaat (general charity) we find it is only advocated by God that we should be charitable as much as we can but it is not compulsory. First: Zakat is payable whenever income is received while the Sadaqaat, being a general act of charity, is not tied to any time. Second: Since the Zakat is paid when income is received then it must be paid out of that income, usually paid in cash, while as the Sadaqat is not timed to a received income and thus it can be paid in any form (money, food, clothes … etc). It must also be said that in special cases, like a farmer who harvests a crop, the Zakat may be paid in the form of the crop itself, but these are special cases. The majority of people receive their income as cash/cheques. The recipients of the Zakat are outlined in 17.26. In this verse, we have the word ‘Haqahu’ which means their decreed right, and which indicates that God is speaking about the obligatory Zakat, and they are: The relatives, the needy and the homeless. The words in 2.215 give a more detailed description of the recipients mentioned in 17.26, but as we have seen (under section 5), they are the same recipients. In contrast, the distribution of the Sadaqaat is outlined in 9.60, where the word ‘Sadaqaat‘ is used, and the recipients are in the following order: the poor, the needy, the workers who collect the Sadaqaat, the new converts, to free the slaves, to those burdened by sudden expenses, in the cause of God and to the homeless. We note from the above that the recipients of Zakat are not identical to the recipients of Sadaqaat. Fourth: God does not tax the believer twice on the same income. We are already obliged to pay Zakat whenever we receive income (6.141), so if we are obliged to also pay a Sadaqa that means we would be taxed twice on the same source. We read in 6.141 how we must pay the Zakat upon receiving income. This indicates that it is a direct payment from us to the recipients. However, when we read 9.58, and how some people have criticized the distribution of the Sadaqaat by the prophet, we can see that the Sadaqaat have been collected (into a fund, or safe, etc) then it is distributed by whoever is in charge. This is also confirmed with the decree that the ones who collect the Sadaqaat should have a share in it. 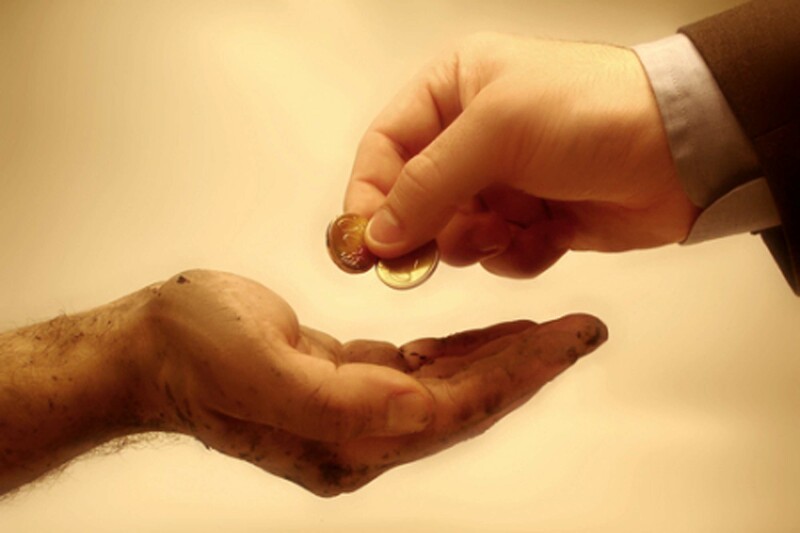 As a result, the Zakat is paid directly to the recipients while the Sadaqaat may be collected then distributed. We see many Islamic institutions today (mosques and Islamic organisations) doing just that by setting up collection box’s for Sadaqaat. 10- Why are the recipients of Zakat and Sadaqat not exactly the same? As we have seen, the distribution of the Zakat, which is detailed in 17.26, is obligatory since the Zakat itself is obligatory. However the words that describe the distribution of the Sadaqat (9.60) are given as a guide only and they are not obligatory. An act which is voluntary cannot have an obligatory method of distribution. So in principle we must give the zakat to the recipients in 17.26, but our Sadaqat can go to anyone we like. We may wish to give a Sadaqa to someone who is not outlined in 9.60, and that is well within our rights. If we do not have any particular recipient in mind and we wish to give to charity then we are advised to follow the guide lines in 9.60. We note that the recipients of the Sadaqat in 9.60 do not include the parents or relatives. God, the Most Wise, knows that the parents and relatives will be already looked after through our zakat, but since there are many more needy people in the world than all our relatives put together, then any additional charity we are able to give (Sadaqat) should go to the needy people, the homeless and so on. 1- They refer to 2.276 and 30.39. In 2.276 the word Sadaqaat is used as opposed to the illegal ‘Riba’ (Usury), while as in 30.39 the word Zakat is used as opposed to Riba. As a result they state that since both are mentioned as opposed to Riba, then they must be identical in meaning. But this is not necessarily so, the mention of Sadaqaat and Zakat (on one side) as opposed to Riba (on the other side) does not necessarily mean they are the same thing, it can mean that they are both lawful and righteous as opposed to Riba which is unlawful and unrighteous. 2- The second reason they put forward to justify this claim is that the word “farida”, which means compulsory duty, is used in 9.60 in connection with the distribution of the Sadaqaat and not Zakat. They follow that by saying that since the details of the distribution are spoken of as compulsory then the task itself (Sadaqaat) must also be compulsory. This is followed in 9.60 with a specific way in which the Sadaqaat must be distributed and then God follows that by saying that this manner of distribution is the lawful one decreed by God and thus it becomes a ‘farida’. a- God is telling the prophet how some will grumble at the way he distributed the Sadaqaat. b- God prescribed a specific method for distributing the Sadaqaat upon the lawful recipients and God adds to that that this is a ‘farida’. In other words: no one should grumble since this is the lawful way prescribed by God and which makes it a ‘farida’. c- We also note that the word ‘farida’ in 9.60 comes after the recipients are mentioned and not after the word Sadaqaat. If the compulsory aspect was related to the payment of the Sadaqaat itself we would expect the words to say “the Sadaqaat are a farida and they are to be distributed on so and so ……”. d- Finally, the distribution of the sadaqaat detailed in 9.60 becomes a law for all people and all believers and not just the prophet. This is particularly important considering that there are many Islamic institutions and mosques all over the world today who collect Sadaqaat. They too must follow the law set by God (farida) in the way they distribute these Sadaqaat. To conclude, the payment of the Zakat is a “fard” (obligation) on all believers who receive an income. It must be distributed according to 17.26 and must be paid as soon as the income is received. Sadaqaat is not obligatory but is encouraged by God, it can be paid at any time, and in any form (money, clothes, food) and it is the law of God that whoever collects it must distribute it in accordance to the details in 9.60.
you have a very nice blog! The pictures you have used are extremly good, so I used some of them for my own blog, which is also about islamic topics, but in german (www.islamundkoran.de – it’s not online yet). If you don’t want me to use the pictures, please send me an email and I will delete them, but it would make my team and me happy, if you allow. no problem brother, you can use both my images and my articles freely. It’s good to promote the truth of Allah as far as possible. That’s true.. Thank you very much.